Happy New Year from EnergyFirst! 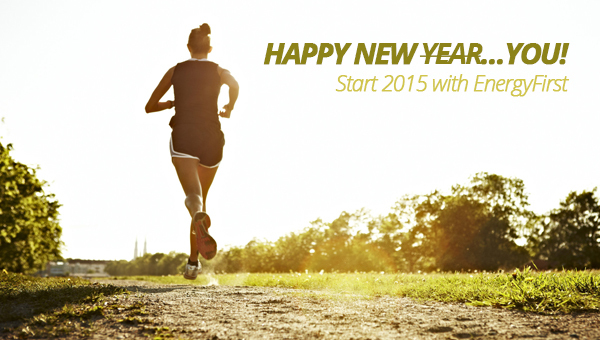 It has been a busy year at EnergyFirst and we are excited to be a part of your nutrition goals in 2015. We would like to welcome our new friends from 7 Natural Laws and Permalean to our EnergyFirst family. EnergyFirst announced the acquisition of 7 Natural Laws and the acquisition of Permalean this year. It is great to have them on board as we continue our growth! Look for new labels and continued improvements to the Permalean Protein Bars in 2015. We are excited about the progress of a new study at USC that chose EnergyFirst ProEnergy to help restore strength in cancer patients. They will be measuring immune system benefits, changes in mood, and a number of other biomarkers. We will share it with you when it's published! EnergyFirst released our new Prefuel Pre-Workout product in 2015 with great results. We will be refining the product in the future to ensure that it remains the very best all natural, healthy pre-workout drink available anywhere. We began surveying our customers at the point of purchase this year and would like to thank you all for your feedback! One great thing we learned is that 98% of EnergyFirst customers would recommend EnergyFirst to a friend of family member. Nothing could make us more proud! You can click here to read the reviews of almost 1000 customers. Let us know your thoughts and leave a video review if you can. We really appreciate it! You can also join our family of over 66,000 fans on Facebook. Everything we do here at EnergyFirst begins with you. We are committed to offering the world's best, all-natural, organically sourced products with unparalleled customer service. We have lowered our free shipping cutoff to $100 recently to ensure that most of our customers never pay shipping costs and there is also (for now at least) no tax withheld on orders outside of California. We offer you a 100% satisfaction guarantee on everything we sell, so you can order with confidence. Take advantage of the tremendous value in our case discounts of ProEnergy, Greenergy, Prefuel, and Permalean protein bars. These and our shake kits can also make great gifts in the New Year. Please respond to this email with any questions, comments, or feedback. We exist to change lives. That's what we do. We do it through offering the best possible products at a great value packaged with cutting edge education and world-class customer service. We are always here for you if you need help in your journey to be the best "you" that you can be.